This recipe is a homage to a close friend of mine. Actually the first friend I had here in Mallorca. One day, she cooked for me, this amazing eggless spanish omelette because at the time she would´t eat eggs. It was incredible. I was really impressed. At the time I thought I would have to try something else that traditionally uses egg, but using her secret ingredient: chickpea flour. I love this challenges. (Not that I have anything against eggs, for me they are a great wholefood if they are organic of course). That was long before this ingredient was used as much as today. It even has a book about it “Chickpea flour does it all”! When I was living in the South of France before arriving to Mallorca I tried the well known Socca from Nice, made with chickpea flour, which is like a big pancake baked in an iron pan cooked in a wood oven. You eat it hot with your fingers and I can assure it is delicious. In Italy they have their version called Farinata, and in Argentina ( introduced by the Genoese) it is called Fainá. So there is a good solid tradition with this magical ingredient. It is not just something that is fashionable now a days. I like that. The time passed and some months ago I had this idea about replacing the eggs in a traditional quiche. Let me tell you that I have a french husband that wasn´t very happy with the idea. So I said, ok, if it is good, I will use quotation marks just not to offend anyone. And even if I had no intention in searching something that would replace the cream, my first attempt turn out great! I just made my socca recipe, added plenty of herbs, and the result, even for my frenchie husband, was amazing. Even my son who is my recipe tester number one, ate it two days on a row! 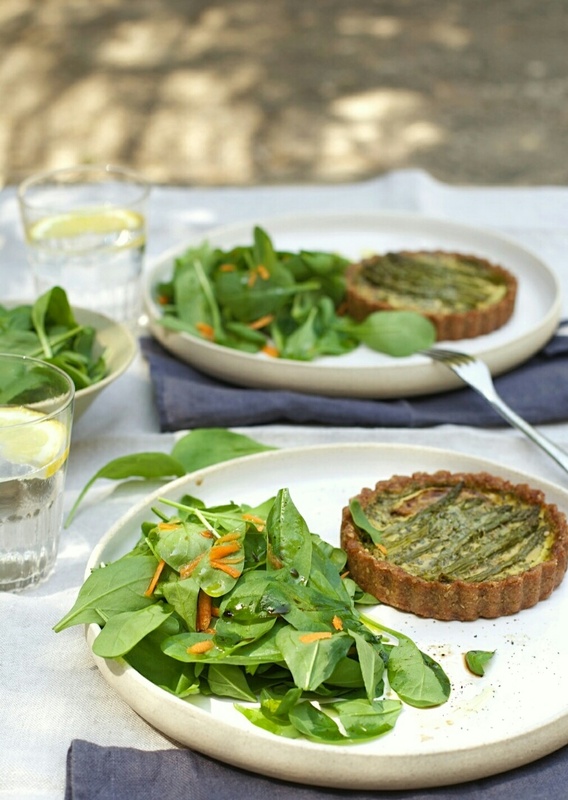 It is very convenient because it lasts several days, and it is a great option to bring to a picnic when it is summer and you don´t want to stress about eggs and cream in a hot environment. And because the flour is soaked overnight you are going to digest it better, and it is much lighter than the traditional one. And when it is hot, that is a bonus. Even if the whole recipe seems complicated, you just have to make a crust ( in this case from Amy Chaplin´s great book “At home in the whole food kitchen”), use the oven to bake it in a row with the vegetables and then all together with the filling (that may seem long too, but that is because it is filled with herbs). 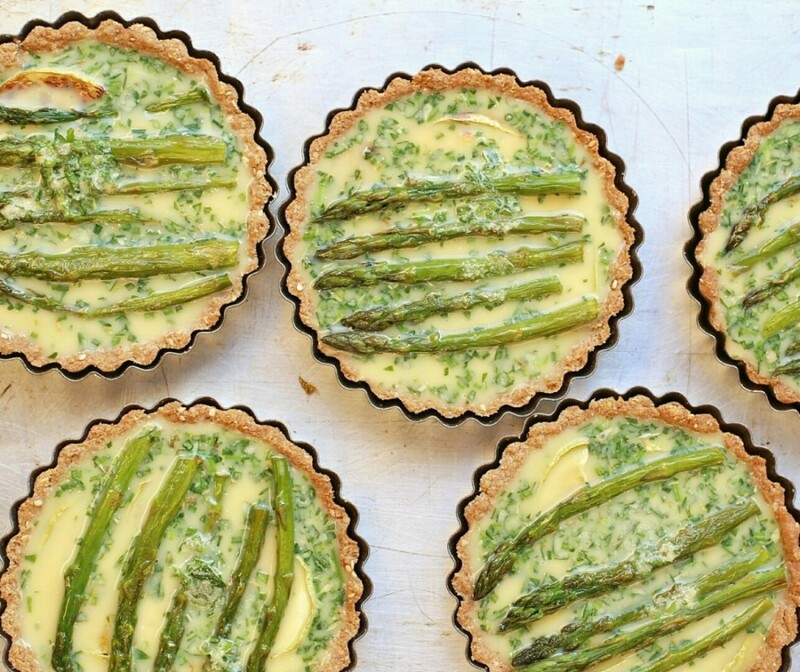 You could also make a large “quiche” instead of several small ones. It will be easier but will take a bit longer to cook. And maybe add some other vegetables you have on hand. Anyway, I just hope you like it and make everyone happy as I did. 1/4 cup plus 2 tbsp extra virgin oil, plus more to oil the tart pans. olive oil to cook the veggies and sea salt . Let the chickpea flour, water and salt soak overnight well covered. The next day, preheat oven to 180ºC . Slice the zucchini in 3 or 4 mm and distribute on a tray. Put the asparagus on a pyrex . Drizzle each with olive oil and sea salt and bake for 10/15 min. Set aside. 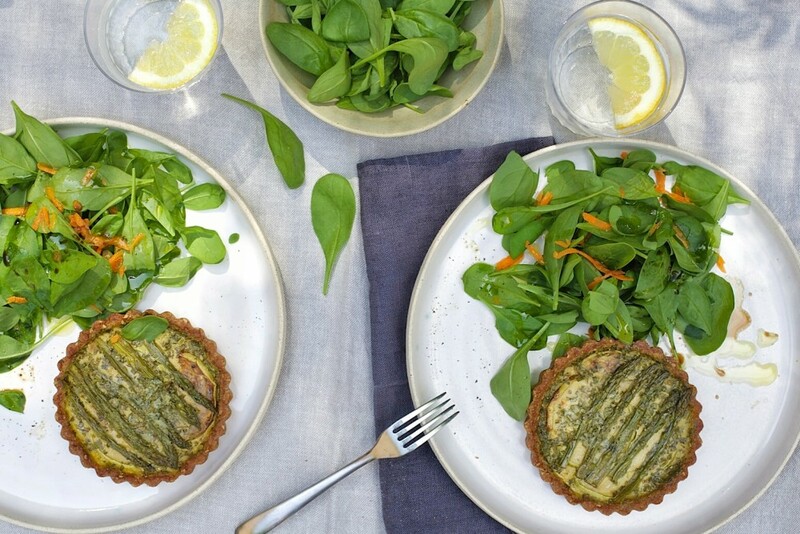 Meanwhile, prepare the crust by blending in a food processor the sunflower seeds, oats, rice flour, baking powder, salt and 1/4 cup spelt flour until finely ground. Transfer to a medium bowl and stir the remaining spelt flour and sesame seeds. Drizzle in the olive oil, and using your fingers, mix until all flour is moistened. Stir almond milk and squeeze pastry together with your hands. It should be moist but not sticky. If it is seems crumbly or dry add a splash of almond milk or water. 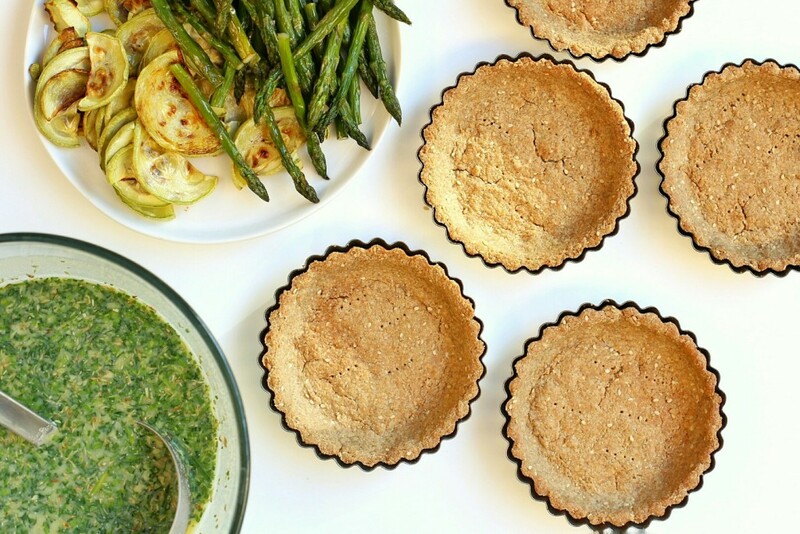 Oil your tartlet pans and press the crust thinly and evenly. Trim any excess pastry from the edges. Prick bottoms of crust with a fork several times and bake for 15 minutes. Remove from the oven. Take the bowl with the soaked chickpea flour, add all the herbs, lemon juice, olive oil and salt and stir well. 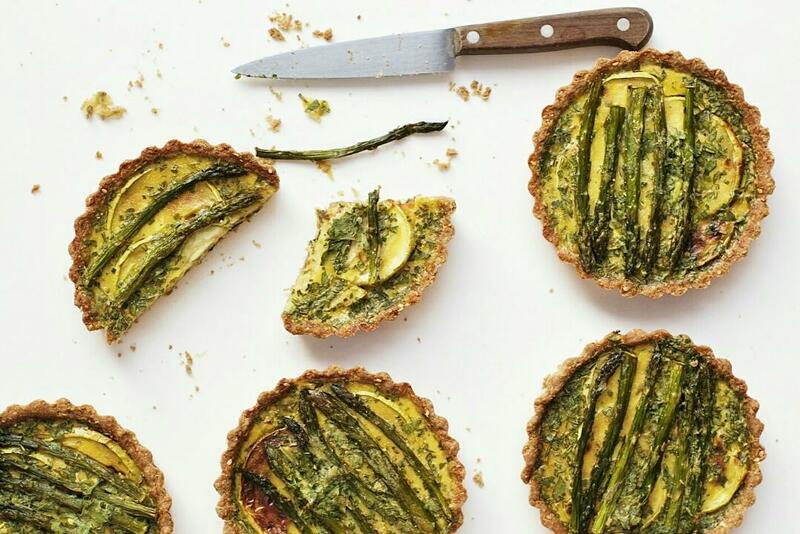 Arrange some of the zucchini on the bottom of the baked crusts, then add a bit of liquid, some more zucchini, some more liquid and top with some asparagus. It should be well filled so it won´t look too low once cooked. Bake for 20 more minutes at 200ºC plus 5 minutes at 180ºC until it is golden. Serve with an simple green salad.